Awake at five am. I lay in my bed enjoying the feel of cotton sheets and the ability to stretch and move, not being confined by a sleeping bag. My ride is at six. I roll over and snooze for another thirty minutes. My zero day was so relaxing it's hard for me to get up and go to work, hiking the PCT. Breakfast is the rest of the remaining cookies Mark brought and Cool Ranch Doritos, I don't think this is the breakfast of champions, but it's my breakfast today. PJ arrives at six am and I am ready. A quick ride to the trailhead and I am started back over Kearsarge Pass. I don't know if it's my lame breakfast or if I'm in a funk but I don't feel like hiking today. I drag myself one step at a time. The trail is steep and there is a cold breeze. Not quite as bad as when I came down, but bad enough to make me miserable with cold. I don't want to do this today. I keep going. Sitting down and pouting doesn't change anything. Slowly, ever so slowly it seems, I gain altitude. The streams rush pell-mell down the hill, too fast to be happy, the streams roars and froths. It's angry, if you step into it it will drag you away down the mountain. The pass is lonely and desolate, not even a tree. Windswept and inhospitable I celebrate in my head as I quickly keep moving down the hill. Down to the warmth. Down to the horizontal world I find normal. I try eating more snacks but the funk remains. Climbing up Glen Pass is a chore. There is stunning beauty but I'm too lazy to pull out my camera. The snow is thick and the trail is at times hard to follow. Glen Pass is steep. The trail is in a hurry to get over the pass. I climb and struggle my way to the top, slowly. From Glen Pass I can see Rae lakes. My favorite lakes. They are down and far away yet it seems like I can reach out and touch them. Green blue gems sparkling tantalizingly close but separated from me by thousands of vertical feet and vast snow fields. I begin down and across the snow. Across first, to the rocks, perhaps safer than this snow field that gets steeper below, I can't see the bottom. My feet are wet, I'm tired, but I can't stay here. Down on the rocks, the trail appears and disappears beneath the snow. Lots of switchbacks, I can only see the middle. I climb down rocks from one small piece of trail to the next. When will things stop being so vertical? A short slide and a long march across the snow brings me to more trail. This trail is secondarily a creek. Mostly a creek this time of year. More water in the shoes, cold, wet, clammy feet. I am tired of wet feet. I try to hop from rock to rock but the water still splashes my shoes. Down, more down, closer and closer. 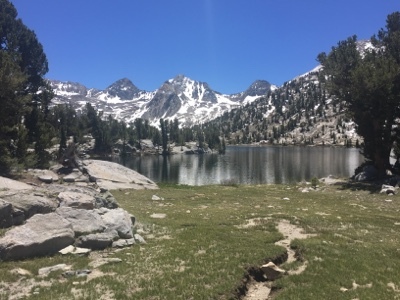 Rae lakes are the quintessential backpacking destination. They have everything, sandy beaches, hungry trout, stunning views of the mountains surrounding them. Campsites are close to the water and shaded. The Rangers like it so much they have a ranger station. Cool clean water gushes from springs and cascade down into the lakes. I am exhausted, it's only noonish but I've already climbed two passes today. I pause for lunch and end up taking a nap. I don't check the time but I feel somewhat refreshed. Refreshed enough to realize that I am not camping here. The trail calls and I must go. Goodbye Rae lakes, I hope I can visit you again someday. Down the canyon, downhill, gliding, coasting, on autopilot. My trekking poles clickity-clicking on the rocks, in the background the nonstop roar of water heading down the hill. I see no one. I am alone, been pretty much alone all day. I left Independence alone and I seem to be in a void between pods of hikers. I wonder where Braveheart and Pathfinder are. Somewhere out ahead of me, probably five to ten miles ahead. I am moving slowly today so they are getting further and further ahead every hour. The John Muir Wilderness is a great place to be alone. I follow the trail meandering down the canyon all the way to Wood Creek Bridge. Here I camp. Here I find others, most of whom have hiked up from Paradise Valley, wherever that is. These are short-termers in for a few days of R&R before heading back to work. This is my work. Hiking this trail. It is work, a lot harder than I thought. I eat dinner and climb into my tent long before the sun sets. I need some sleep.